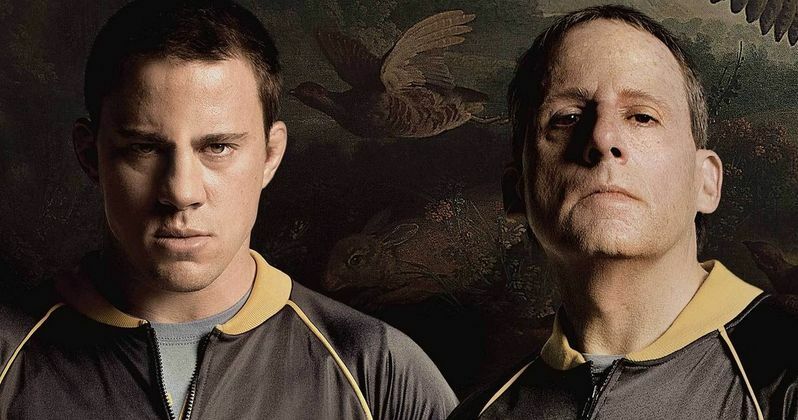 Following the final trailer released two weeks ago, Sony Pictures Classics has debuted a new theatrical poster for Foxcatcher, featuring all three stars, Channing Tatum, Steve Carell and Mark Ruffalo. It remains to be seen if this talented trio will be able to secure Oscar nominations for director Bennett Miller's drama based on a true story, but the buzz leading up to the November 14 release indicates that may be possible. Steve Carell stars as John du Pont, the heir to the du Pont chemical fortune, who invites Olympic gold medal-winning wrestler Mark Schultz (Channing Tatum) to help form a team for the 1988 Seoul Olympics, as Mark tries to escape the shadow of his brother, Olympic legend Dave Schultz (Mark Ruffalo). While du Pont begins luring Mark into an unhealthy lifestyle, his benefactor begins to turn his attention to Dave, who has everything that Mark lacks. Fueled by du Pont's increasing paranoia and alienation from the brothers, the trio is propelled towards a tragedy no one could have foreseen. Take a look at the new one-sheet before this true-story tale unfolds on the big screen starting November 14.